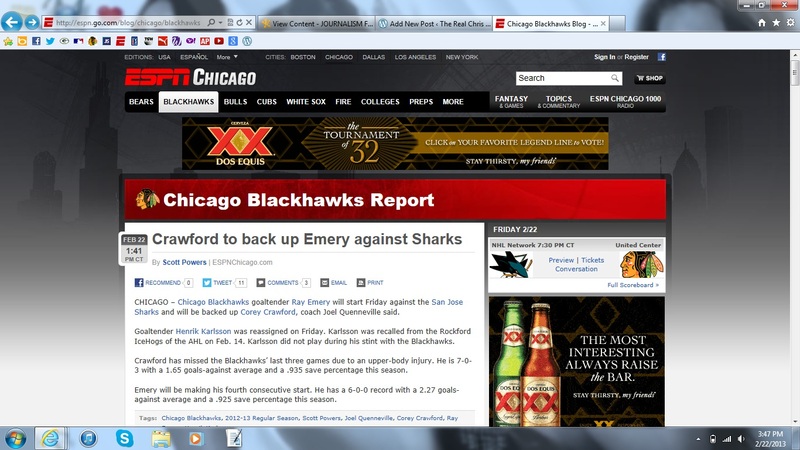 The blog I will be reviewing is the Chicago Blackhawks blog through ESPN.com. Being a Blackhawks fan, I read this blog to learn about the latest team news. I will be taking a closer look at the blog to determine its strengths and weaknesses compared to other news outlets. There are menus for categories and the blog’s archives, as well as a “Recent Updates” section which lists the most recent publications. In addition, there is a Twitter feed with access to latest news and updates. A schedule of upcoming games and team leaders for certain statistics are included as well. Other team resources — such as schedule, stats, roster, rankings, transactions, tickets and forum — are on the right side, too. It appears as if the blog is mainly supervised by Powers, but because it is run through ESPNChicago.com, I would think he receives assistance with editing, multimedia, etc. Powers posts on the blog on a daily basis. Most days, he will post about three stories. Powers uses simple language and targets Blackhawks fans, mainly those who are up-to-date with the team. He views his audience as educated, and his insights provide readers with further knowledge about the team. Some stories are long. Others are short. It all depends on the significance of the story and how many details the reader needs to be fully informed. He includes many names, statistics and other information to familiarize readers with the players, coaches and team in general. For example, in his brief article about Goaltender Corey Crawford backing up Ray Emery against the Sharks, Powers says, “Crawford has missed the Blackhawks’ last three games due to an upper-body injury. He is 7-0-3 with a 1.65 goals-against average and a .935 save percentage this season. Emery will be making his fourth consecutive start. He has a 6-0-0 record with a 2.27 goals-against average and a .925 save percentage this season.” This provides the readers with information enabling them to compare the two goalies and make their own assumptions as to how the team will be affected. Powers uses various forms of multimedia, including text, video and photos, although most of his content is text-heavy. Powers includes links that say, “Read the entire story,” taking readers to a location where they have additional content at their disposal. Multimedia typically enhances posts, but Powers relies on his words to help readers understand the main point of the story. His use of multimedia is rather dispersed, and he uses it as a tool to add more insight and perspective to stories that are hard to describe using only words. Because ESPN is the most prominent media outlet in the sports world, Powers does a good job reporting stories in a timely manner. However, other sites, such as Facebook and Twitter, beat Powers to the news in many instances. Social media has the upper hand for breaking news stories. For example, the news about Marian Hossa being available for tonights’ game against the Sharks was released on Chicago Blackhawks Nation’s Facebook page before it was reported on the blog. That being said, Powers reported that Steve Montador has practiced with the team for the first time this season, and the Chicago Blackhawks Twitter feed did not even report that. Powers’ stories include more in-depth reporting and have more credibility than either Facebook or Twitter, both of which report the initial news quick but without further details. Twitter is better for in-game updates, while the blog is better for post-game analysis. They work together to give Blackhawks fans everything they need to know. In comparison to other sites, like secondcityhockey.com, there is not a noticeable difference between which is the first to report a story. Both do a good job with in-depth reporting and consistent delivery to their respective readers. In conclusion, the Chicago Blackhawks blog through ESPNChicago.com is an effective outlet that provides reliable news. Its only problem is social media often breaks news stories before it, but it makes up for the issue with more detail in later reports. 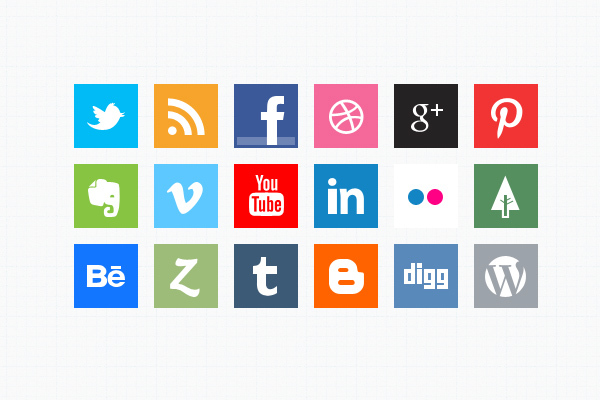 The battle against social media is to be expected with any blog. Overall, this blog is a great way to consume news about the Chicago Blackhawks. Ted Thompson has never been one to make sentimental decisions during his time with the Packers. Just over a week since Donald Driver’s retirement party, the Packers have cut ties with another one of the franchise’s most beloved players, Defensive Back Charles Woodson. Thompson signed Woodson as a free agent in 2006. After Woodson was cut from the Oakland Raiders, his character was in question. Despite the criticism, Thompson decided to give Woodson a chance. It paid off. 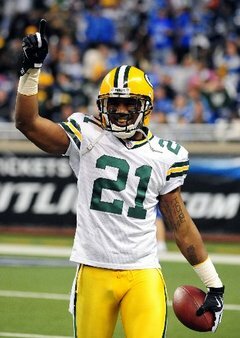 During his seven seasons with the Packers, Woodson was one of the team’s leaders. He was named to the Pro Bowl four consecutive seasons, from 2008 through 2011, and was named AP NFL Defensive Player of the Year in 2009, joining Reggie White as the only Packer to receive the honor. Woodson holds the franchise record for most defensive touchdowns with 10 and is fourth in franchise history with 38 interceptions. He’s one of those players that quarterbacks around the league have to be aware of. Jay Cutler knows what I’m talking about. Woodson was arguably the best free agent acquisition in Packers history. Yes, even more than White. Don’t be surprised to see his name in the Packers Ring of Honor someday. Not only that, Woodson is sure to end up in the Pro Football Hall of Fame. Perhaps more impressive than his statistics was Woodson’s ability to inspire those around him and lead by example. Who can forget Woodson’s legendary speech after the 2010 NFC Championship Game? Woodson made a promise to the president that the Packers would be making travel plans to see him at the White House after they won Super Bowl XLV. He kept his promise. He was an integral part in the Packers Super Bowl run that season. The list of accolades goes on, but let’s not get caught up in the sentiment of this decision. After all, there’s still a business side of things. Cutting Woodson provides the Packers with an additional $10 million in salary cap space, giving them more flexibility to prepare for future contracts with core players, including Aaron Rodgers, Clay Matthews and B.J. Raji. Tough decisions must be made. But now is the time to do so. Woodson can still play. There’s no doubt about it. He has plenty of gas left in the tank, and I have no doubts that he will be a great asset on another team for at least a couple more years. He may even win another Super Bowl before he hangs up the cleats. With a plethora of young talent on the rise in the Packers secondary – Sam Shields, Davon House, Casey Hayward, and M.D. Jennings – letting go of Woodson to clear cap space was the right decision. Simply put, the Packers aren’t the best fit for an aging defensive back, especially for $10 million. Woodson found a home in Green Bay, and I’m sure I speak for Packers fans everywhere when I thank him for all he’s done for the organization, on and off the field. Thompson says Woodson will “always be a member of the Packers family.” But it’s time to move on. So, once you see Woodson suited up in another team’s colors, try not to get too attached to the sentiment. It’s just good business. There once was a time when the future of journalism appeared grim. Now, it could not be more bright. With a wide variety of media at our disposal and an overabundance of information at our fingertips, journalistic practices and tendencies are changing. In the long run, it may be for the better. The Internet is responsible for altering the ways in which our brains function, thus affecting the way journalists approach their readers. Journalists must be prepared for change. In “The End of Theory: The Data Deluge Makes the Scientific Method Obsolete,” Chris Anderson says that the great deal of data online changes our perception of the world. As it relates to Carr’s article, Anderson says Google’s founding philosophy is that we do not know why one page of information is necessarily better than another. This leads to our inability to determine which information is credible or not credible, making us “stupid,” so to speak. In “New Rules” by Thomas Friedman, he claims that “technology and globalization are wiping out lower-skilled jobs faster, while steadily raising the skill level required for new jobs.” I find it difficult to argue with his idea. It is a given that the world is changing right before our eyes, and new patterns are emerging. Journalists have to work longer and harder to do their job effectively. The three articles above bring me to the main question: What is the role of the journalist in today’s society? In “Rethinking the Role of the Journalist in the Participatory Age,” Alfred Hermida admits that defining who is a journalist in today’s society is a difficult question to answer. Questions such as “Who is a journalist?” and “What is journalism?” are open to an individual’s interpretation, simply because the field is more involved than it has ever been before. In “Changing journalism, changing Reuters,” David Schlesinger discusses the loss of value and respect in the journalism field, stating that more than half of Americans do not trust mass media to do what has always been its primary goal – to report the truth. There was once a time where most news organizations stressed the accuracy of a news story over its immediacy. That was before the technological revolution of today. Now, while accuracy is still the most important attribute of a story, far more emphasis is placed on being the first to report a breaking news story. Competition in the journalism field is fierce. The journalist’s job is far more complex than it has been in past years. He or she must be able to report the truth quickly and be able to use various technologies to provide audio and video content. It is not a world for the weak. Truth is, until the technological revolution slows down, which may not be for some time, it will be fairly difficult to cast journalists into a specific role because they are constantly adapting to change. What do you think is the role of the journalist? The Baltimore Ravens defeated the San Francisco 49ers in Super Bowl XLVII, 34-31. The Ravens dominated the first half. Jacoby Jones added a 108-yard kick return touchdown to begin the second half, a Super Bowl record. The Ravens led by 22 points. The largest deficit a team has ever overcome to win the Super Bowl is 10 points. The game was essentially a lock for the Ravens. Then the lights went out in the Superdome. The 34-minute power outage slowed the Ravens’ momentum and gave the 49ers an opportunity to make a comeback. The 49ers overcame a 17-point deficit to win against Atlanta in the NFC Championship game two weeks before, so another second-half surge was not unthinkable. When play continued, the 49ers scored 17 unanswered points in less than 4 1/2 minutes. The Ravens appeared to be letting the game slip away, especially after a Ray Rice fumble that led to a field goal for the 49ers. In the end, the 49ers could not muster enough points to beat the Ravens. Ravens quarterback Joe Flacco gave himself a great deal of praise at the beginning of the season, calling himself the best quarterback in the NFL. 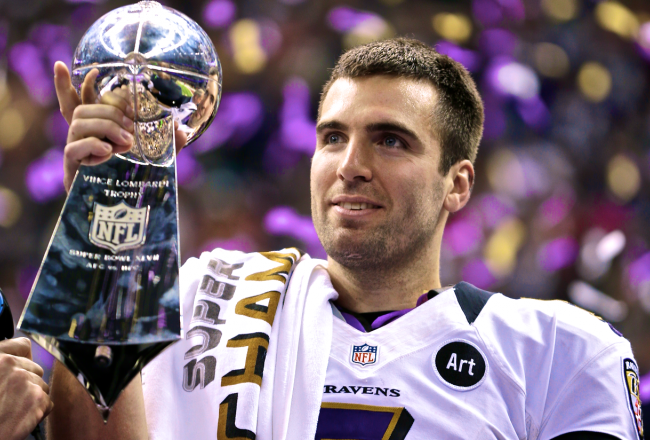 With a Super Bowl title, and playoff wins against Peyton Manning and Tom Brady this postseason, Flacco may indeed be relevant in the “Elite QB” conversation. Ravens head coach John Harbaugh faced his younger brother, 49ers head coach Jim Harbaugh, on the game’s biggest stage. This was the first time two siblings coached against each other in the Super Bowl. The 49ers lost their first Super Bowl in six appearances. They have won five Super Bowl titles and trail only the Pittsburgh Steelers for most championships in the Super Bowl era with six. To conclude his impressive 17-year career, Ravens linebacker Ray Lewis walked off the field for the last time as a Super Bowl champion. Lewis is arguably the best linebacker to ever play in the NFL. His 13 Pro Bowl appearances, Super Bowl MVP in 2000 and NFL All-Decade honors provide a strong argument for a spot in the Pro Football Hall of Fame. During Media Day, 49ers wide receiver Randy Moss said he is the best receiver to ever play the game. Former 49ers wide receiver Jerry Rice, who is now an ESPN NFL analyst, holds all-time records with 1,549 receptions, 22,895 yards and 197 touchdowns, not to mention three Super Bowl rings. Moss claims he does not care about statistics but the impact a player makes on the field. Sorry, Randy. Rice wins this one. After an unimpressive finish to the regular season, the Ravens entered the playoffs as the No. 4 seed in the AFC. With games against the Denver Broncos and New England Patriots in the AFC Divisional Round and AFC Championship, respectively, the Ravens were written off as Super Bowl contenders. A few weeks later, the Ravens are standing atop the football world with the franchise’s second Lombardi Trophy. Who would have thought? Super Bowl XLVII had everything a football fan could want. Brothers faced off. Points were scored. Records were broken. Legends were made. The offseason has begun. Who is your pick for Super Bowl XLVIII?